Having raced in the Ridgeline Rampage on Saturday, I can cross the first mountain bike race of the year off my list of things to do. 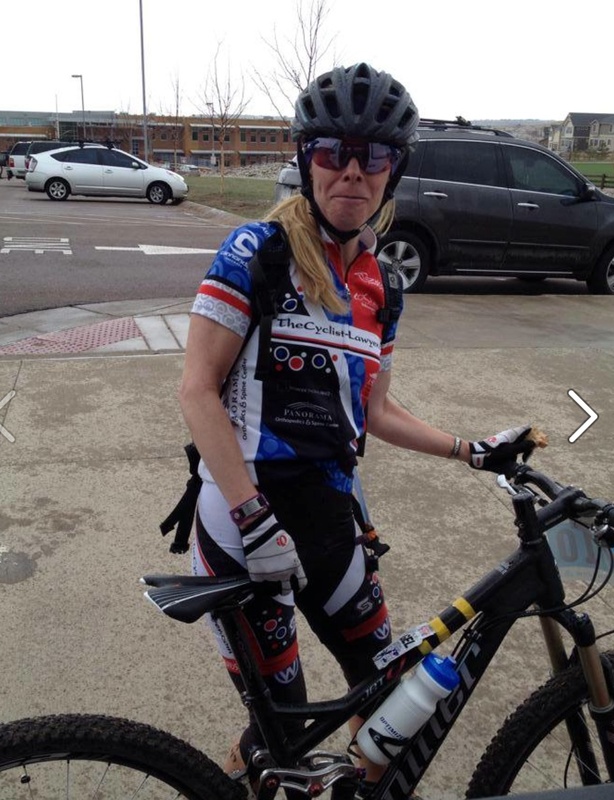 When I arrived in Castle Rock for the race, the weather was somewhat cool and overcast. The weather forecasters had been predicting afternoon rain showers. I had packed a variety of clothing so that I would be prepared no matter what conditions I would be racing in. I had ridden this race last year, so I knew what to expect for the most part in terms of course terrain and elevation changes. However, this year, the course was going in the opposite direction. Somewhere in the back of mind I thought this might mean that there would be more climbing involved, but overall, it should be very similar in either direction. I picked up my race number, t-shirt and goody bag at the registration table. All the while the sun seemed to be hinting that it might actually make an appearance and warm things up for the afternoon races. I was early enough that I had time to cruise around looking for team mates and visited the pit area just in time to see my team mate, Carol, pass through. After that I returned to my car, suited up, and began the process of riding up the nearby hills to warm up my legs. I had heard that this year’s field of racers was bigger than ever and wondered how that would play out during the first mile or so of the race. Last year, bikes had literally been tire to tire at the beginning, making for a frustrating and challenging traffic jam to navigate through. As I pedaled around the neighborhood surrounding the race course, I came to see that the first half mile of so of the course went uphill through the neighborhood streets. I suspected the course had been routed in such a way to thin out the racers before we rolled onto single track. To some degree, it worked. But eventually, there came an inevitable traffic jam when too many riders come together in one place on an incline. This is my least favorite part of racing the Ridgeline Rampage. I can’t help but think that spacing out start times would alleviate this problem. As a few cyclists hopped off their bikes and began running them up the hill, I decided to do the same. This turned out to be a mistake because everyone I had just passed ~and then some~ eventually got rolling again and it was impossible for me to find a gap big enough to squeeze into to get rolling again. Lesson learned. 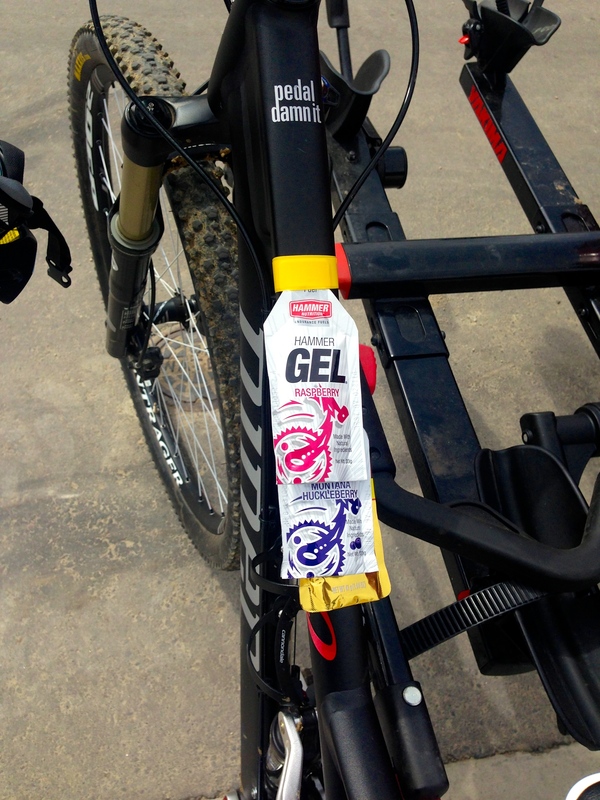 Bebe the Niner equipped with gels readily available for the bumpy terrain. racers as I cruised up the hills. Before I knew it, I was starting in on the food that I had packed with me. I was surprised that I was feeling the need for energy so soon into the race. This is when I concluded ~rightly or wrongly~ that more climbing was required to ride the course in this direction. The good news was that the course was designed with the pit in the center of a figure 8, meaning that I could grab a hand-up of food or liquid if necessary at the middle and end of each lap. I did pass a lot of guys and a few gals, but I never was able to chase down the one or two women in my age group who passed me during the run-up fiasco at the very beginning of the race. As I was closing the second half of my last lap, my triceps were burning, my thighs were screaming at me, and I’m certain I let out more than one whimper as my body protested the continued pain of climbing. After reviewing the statistics later on Strava, I realized that each ten mile lap of the race had 1,000 feet of climbing… no wonder my body was protesting! The wind and rain moved into the area during the last few hundred feet of my race. I rolled across the finish line and went directly to the food tent. Peanut butter and honey sandwiches never tasted so good! Spring riding is some of the best of the year. Let’s face it, we’ve been cooped up indoors all winter for the most part with only a handful of rides outside when it isn’t snowing, blowing like a hurricane, or just entirely too cold to be outside for any length of time, particularly on a moving bicycle. Once daylight savings begins, the evenings are lighter longer. Those precious extra minutes of light can mean the difference between a ride or riding longer. 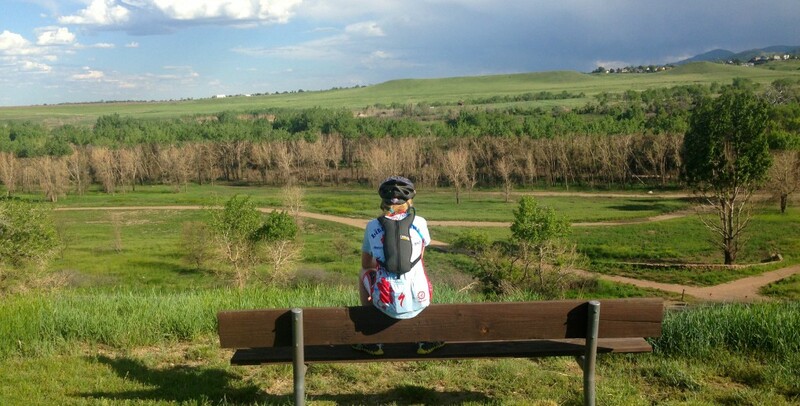 Along with the birds, the wildlife, and the wildflowers, cyclists are also rejoicing for spring! As I was out for my first mountain bike ride of the year the other day, I could hear the hawks soaring overhead. Once in awhile as I pedaled along, they would fly close enough that I could actually hear the flap of wings as they cut through the air. I heard meadowlarks whistle their greetings from fenceposts. It’s not uncommon to see deer on North Table Mountain. Typically, I see them in clusters of 2-5 deer. But this time there must have been ten young deer grazing along the singletrack. Most of them just stood there and watched me pedal by. Typically, the deer will scatter when you approach, but I guess this young batch had not yet been spooked by a human before and saw no reason to flee from me as I went by. A few wildflowers were blooming here and there. In fact, they were so small I wouldn’t have noticed them if I hadn’t stopped for a drink of water. Normally I wear a hydration pack of sorts while mountain biking, but on this day I had decided to forego it and loaded my jersey pockets with tools and filled a water bottle instead. I knew it would slow me down to drink, but seeing the tiny lavender and pink petals made the stop worthwhile. This connection with nature that you can only experience while in its midst has got to be one of the simplest pleasures life has to offer. Experiencing it on a bike while your heart is pounding, your feet are pedaling, and your breath is audible magnifies the soothing nature of the experience. It’s almost like you experience it in slow motion, from a hawk’s perspective. The rhythm of your pedal strokes and breath colliding so perfectly with nature’s circle of life… it’s like they were made for each other! But don’t take my word for it. Go see for yourself! 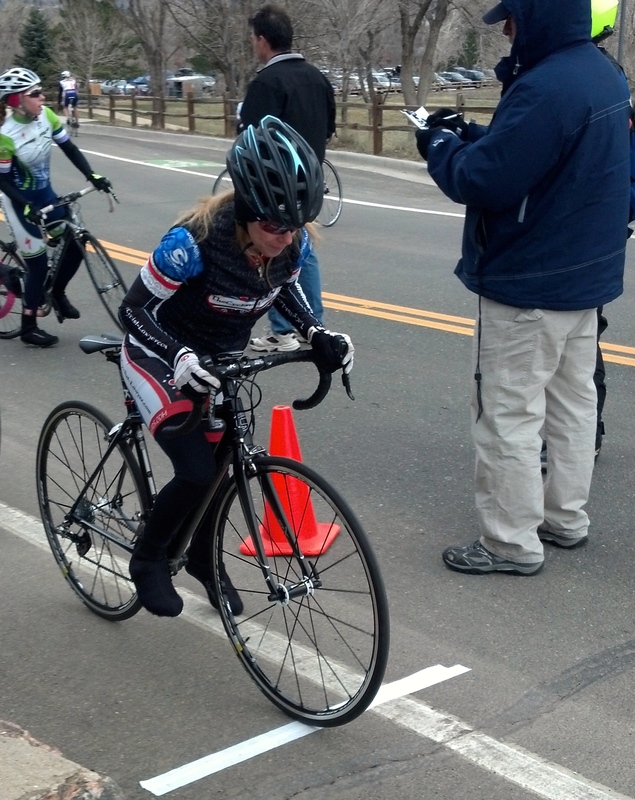 It was a crisp Sunday morning and I intentionally had not pre-registered for the criterium race because of Colorado’s notorious winter-like weather conditions in the Spring. It had been only 26 degrees and snowing the day before! 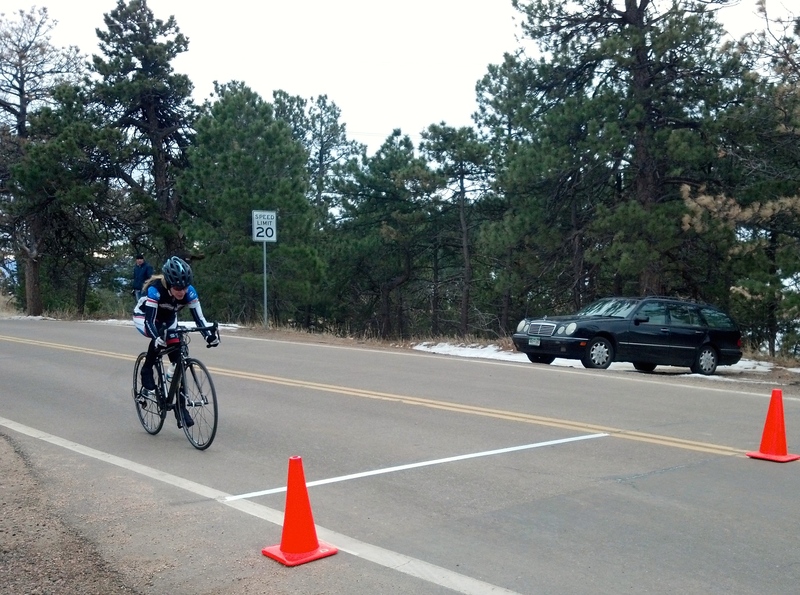 I arrived early at the Stazio Baseball Fields for the University of Colorado Stazio Criterium. I sat and watched some of the collegiate races as the sun continued to burn off the crisp morning air. I was exchanging text messages with a teammate and soon concluded that if I did register for the race, I’d be the lone representative in the peloton from my team. I finally decided to end the procrastination and registered for the race. I headed back to my car and bumped into a former teammate who was also racing. We agreed to meet after warming up and head to the start line together. It’s so nice to see a friendly face before a race! The peloton was quite large with 30-40 cyclists as they had grouped both beginners (Category 4) with more experienced (Category 3) racers. As we took off on our first lap, there was the usual shuffling for position as we rounded the first corner and started up a slight hill. Then we crested the hill, headed downhill and around to the start line. The second lap began much like the first. As we circled back to the start line again, I noticed that the peloton slowed significantly as we rolled by the announcer and what few spectators were there. I had moved to the outer left side of the peloton in anticipation of the right turn we would be taking. Ahead of me, a couple of cyclists began to wobble back and fourth. Suddenly, the woman to my left was thrown over her handle bars to the pavement. I thought I was over far enough to avoid her and her bike. No sooner had this thought crossed my mind when I found myself laying on my back on the pavement. As bodies and bikes came to rest around me, I found myself still clipped in on both sides, struggling to free myself from the bike so I could get up. A kind spectator came to my aid and helped me out of my pedals. I laid on the street for a couple of moments, wiggling all ten toes and all ten fingers, trying to decide if I was going to be able to pick myself up. Everything seemed to be in working order, nor was there any substantial pain or blood. I slowly stood up to see a shocked crowd of people staring back at me. I grabbed my bike and quickly inspected it for damage. I knew the peloton would soon be coming around and I wanted to get back into the race without dwelling for too long on what had just happened. The race official directed me on where to line up as the peloton approached. I was off for the second time. We did two more laps before the race was brought to a stop to allow for the ambulance to pick up two injured cyclists who had not moved from the road since the crash. We continued circling the parking lot in an attempt to keep our legs warm. When it was time to line up and restart the race, I began to notice the aches and pains I had sustained in the crash. Sharing the story of what had happened with understandably curious racers didn’t help me mentally. As I started this race for the third time, my body was aching and my mind was no longer competitively engaged. I had lost my race mojo for the day. I just wanted to finish it and go home. I had two opportunities to bail out on this race: one when the crash happened and another when the race was stopped for the ambulance. I’m not exactly sure what it was that initially got me up and going again. However, getting those two laps in with the peloton before the race was stopped for the ambulance was critical for me. I was back in the race before I had the opportunity to overthink what I saw, heard, and felt during that crash. Several people have asked me what’s next in terms of racing. I don’t necessarily know the answer today… but I’ll figure it out come race day. Just like I did at Stazio. I’ve discovered that I am a bit of a fair weather cyclist. I just don’t like to be cold. That being said, sometimes you have to do things that you don’t necessarily like. Saturday morning I got up at 5:45 AM to have my usual pre-race breakfast the recommended three hours before my start time. As I was mixing eggs and brewing coffee, I could hear the wind howling outside the kitchen window. The only thing I dislike more than being cold is the wind. I kept telling myself that I could always bail out at the last minute; but if the wind did die down, I needed to be prepared to race. For the next hour and a half after breakfast, I sipped coffee and read more of my book (I am Malala – highly recommend). All of my warmest cycling clothing had been packed the night before and was ready to go. The trainer was already loaded in the car. I just needed to load my bike and hit the road. I checked 3 different web sites for up to the minute weather forecasts at Lookout Mountain. I got different numbers from all three – one had a temperature of 21 degrees and snowflake graphics; another had a temperature of 46 degrees and 27 MPH winds. No matter which one was correct, it was likely going to be a cold, windy race. As I pulled into a parking space at Lookout Mountain, I saw a few team mates. This brought me some comfort… if they could brave this cold, windy weather, surely I could, too! As I pinned on my number and dressed for the warmup, the wind continued to gust. Today would be the first time that I would warm up while wearing my down coat. I was pleased that I began to sweat after a few minutes of pedaling and eventually had to remove the coat. My start time approached and I finished changing into my race clothes and loaded the trainer back in the car. I pedaled around a bit before getting in the start line to keep my legs and the rest of me from becoming chilled. The cold actually proved to be a great distraction from my usual pre-race nerves, which I hadn’t even given so much as a thought on this chilly morning. Normally, as I stand at a start line, I calm my nerves by telling myself that I can vomit at the finish line, if I still feel the need to do so by the time I get there. Five, four, three, two, one… and I was off into the wind. As I pedaled up the 4.6 mile course, I tried to make myself as small as possible when the wind hit my face, and as tall as possible when the wind was to my back. At one point, the wind was so strong that I thought it would bring me to a complete stand still. At that point, I knew that today’s race would not result in any personal bests for me. My only hope was that everyone else would also experience such a gust, slowing the entire field of racers. After crossing the finish line, I pulled to a stop in a nearby parking lot, and for the first time in a very long time, I actually thought I might vomit… I guess that means I gave it everything I had. As I drove home from the race, I realized that despite how windy and cold the ride was, I still had fun and I did not regret going. This is how 99% of my rides/races end. On only one occasion did I regret going for a ride – but that one ended in a crash and I wasn’t able to ride for several weeks afterward… so it doesn’t really count and maybe one day I’ll write about it, but not today! Today’s lesson is that you should ALWAYS go out and pedal, even if you don’t want to. I’m just certain that when you come back home, you’ll be glad you went… 99% of the time! When I was a little girl, I used to help my dad work on our family cars. As his grease monkey, I started out retrieving the various tools & parts necessary for each job. Eventually, it got to the point where I would do some of the work and he would supervise. I guess he knew early on that my independent spirit would take me miles from home and that I would need to have the skill set necessary to prevent becoming stranded. I never minded having a little grease under my nails and after college relished the fact that every dollar I saved on oil changes meant an additional dollar in the piggy bank for something fun. When I hopped on the bike a couple of years ago, I quickly saw that I would need to become self sufficient on some basic and common bike mechanical issues. I didn’t want to be the kind of cyclist who needed to be rescued. And I certainly didn’t want to burden my husband with bike stuff, although he’s been so supportive of this cycling journey since day one. One of the very first clinics offered by my team was a basic bike maintenance clinic… complete with food, beer, and wine! We brought our bikes and actually removed tires and tubes and put them back on. We patched a hole in a tube. We adjusted brakes and derailleurs. I knew the day would come when I would be forced to fix a flat along the side of the road or single track , miles from home or miles from my car. I was fortunate that it was a lovely, sunny Colorado day when it happened. I had just ridden up Lookout Mountain and had stopped for a snack at the top. One of my team mates happened to be pedaling by and we decided to descend down Highway 40 together and perhaps head over to Red Rocks Amphitheater. About one third of the way down, my ride suddenly felt “squishy”. I signaled that I was slowing and came to a stop along the side of the road. A quick inspection revealed what would be my first flat rear tire. I was absolutely thrilled to have an experienced cyclist like Gary there to watch over what I was doing as I pulled off the wheel and retrieved tire irons, tube, and pump. Following the team clinic, I had practiced changing flats at home under the watchful eye of my husband, so the process went very smoothly and I forgot only one step that Gary reminded me of. The route home happened to take me by two different bike shops, but I didn’t stop; there was no need to stop because I was self sufficient! Isn’t self sufficiency everyone’s goal to some degree? It’s what I hope to impart on my daughter, similar to what my dad did for me. If you don’t have kids, your parents very likely wanted it for you, long before you knew you wanted it for yourself. Conquering some small part of the universe, be it a flat bike tire, a broken chain on a mountain bike miles into the woods, or a detached fuel line in your car engine in the middle of nowhere, reduces the fear of the unknown and breeds confidence in going the extra distance or taking the path less travelled. My hope for you is that you’ll find something that you, too, can conquer and it will bring you the confidence to begin your cycling journey ~ or perhaps to take it a bit further. It’s no secret that I’ve just embarked on my cycling journey and the main ride for this journey has been a 13-year-old Cannondale that I like to call Ruby. When I bought Ruby all those years ago, she came with Shimano Ultegra components. At one point, those shifters worked like a dream. Although now it has been so long ago that I can’t remember how that felt, or when it stopped feeling that way. What I know now is that it takes a ridiculous amount of muscle tension and effort to shift one gear on either the big ring or the rear cassette. Post ride, I was frequently left with achy fingers for a souvenir. However, at some point my fingers must have adapted and gotten stronger because I continued to ride and muscle through the gears, but the finger pain subsided. Eventually, I came to accept that this is the way shifting was – effortful. Then one day as I was out for a group ride through a clinic called “Ride with a Legend”, Alison Dunlap settled in beside me. 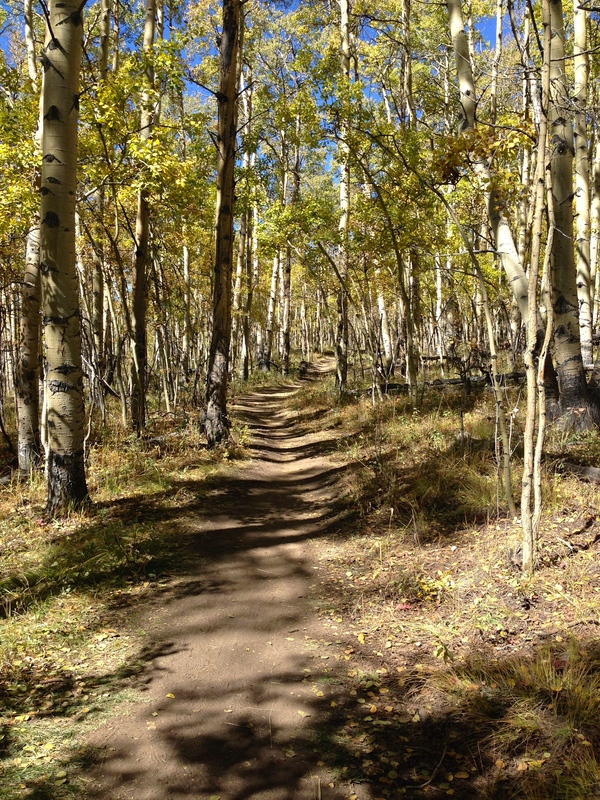 As we chatted and pedaled along over the rolling terrain in Golden, Colorado, I became aware of how effortless shifting was for her. She extended her open hand down toward the shifters and sort of wiggled her fingers in mid air, as if she was tapping her fingers absent-mindedly on a counter top while thoroughly pondering whether or not she did, in fact, wish to change gears. Then, with one finger ~ quite possibly a ring finger~ she quickly and lightly tapped the shifter. With one soft but distinct click, the process of changing gears was complete! In that moment, I was certain of two things: she very likely had never experienced achy fingers from shifting during a ride and that I, too, would one day shift gears effortlessly! When it came time for me to research bikes and all of their options, I heard from many of my teammates who were vocal about not buying this or that component group because “they’re used to what they have”. I decided to be open to whatever components came with the model of bike that I wanted. I figured I’m a human, I can adapt….it’s what we do. My only requirement was that I would be able to shift effortlessly. Isn’t that true about so many things in our lives? You just keep pushing. For my cycling journey, it has meant that I just keep shifting and pedaling regardless of how effortful or effortless each ride is. Because I know that every time I’m out there pushing myself through a ride, I finish the day as a stronger, faster, and perhaps most importantly, happier cyclist, wife, mother, human being. Who goes out and joins a racing team without having ridden their bike consistently for ten years?? Um, I do. Which is why I couldn’t help but describe myself as a cyclist, complete with air quotes for a very long time. Sometimes a laugh would slip out when I said it because the idea of me, as a cyclist, seemed so preposterous. All jokes aside, I was serious about becoming a cyclist. So I started to ride. I rode at every opportunity that presented itself in the fall of 2011. At first the rides were short, but they gradually became longer and faster as my fitness improved. I had a lot of ground to cover ~ literally and figuratively ~ if I wanted to become remotely competitive with the other women on my team and in the sport. I quickly realized that I needed to formulate a game plan for my “inaugural” racing season of 2012. When the racing schedule came out, I picked the races I would do and began to “train” accordingly. 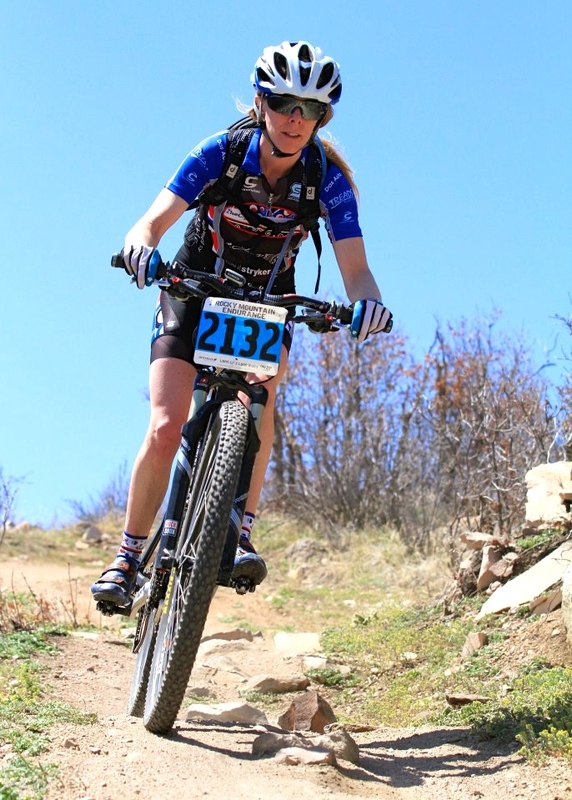 My first race would be the Oredigger Classic Lookout Mountain Hill Climb in Golden, Colorado in March of 2012. To ride from my home to the top of Lookout Mountain and back is a round trip of about 35 miles with about 2500 feet of elevation gain, depending on the specific route ridden. To an experienced cyclist, this seems like a very easy ride, but to someone new to the sport, this would fall into the category of “long ride”, perhaps even “epic ride” given the right circumstances. Complicating my training was the fact that most of it would be happening outside between December and March – winter in Colorado. My approach to training was to check the weather forecast at the beginning of each week. 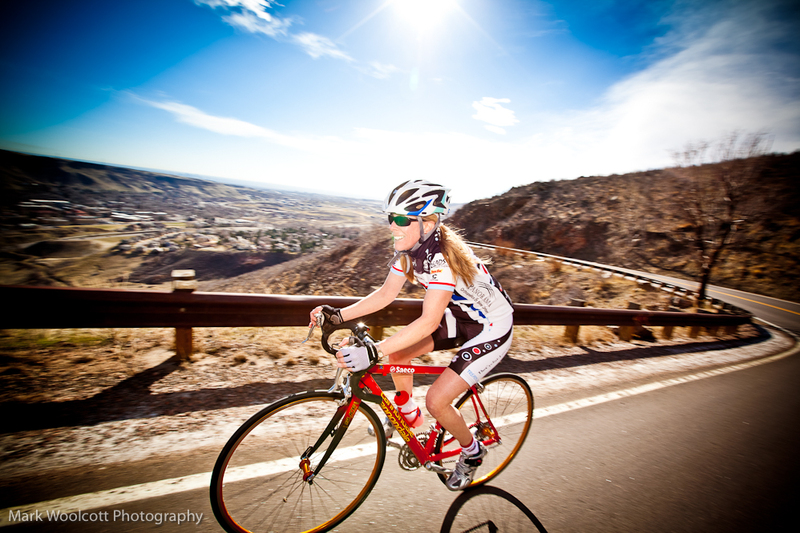 On the warmest day (or two, schedule permitting), I would plan to ride up Lookout Mountain. This also required driving to Golden because I was unable to ride the entire round trip from my house in Arvada. As the weeks passed, I began to park further and further away from Golden, gradually building up my ability to not only pedal up the hill faster, but endure the miles before and after the climb. 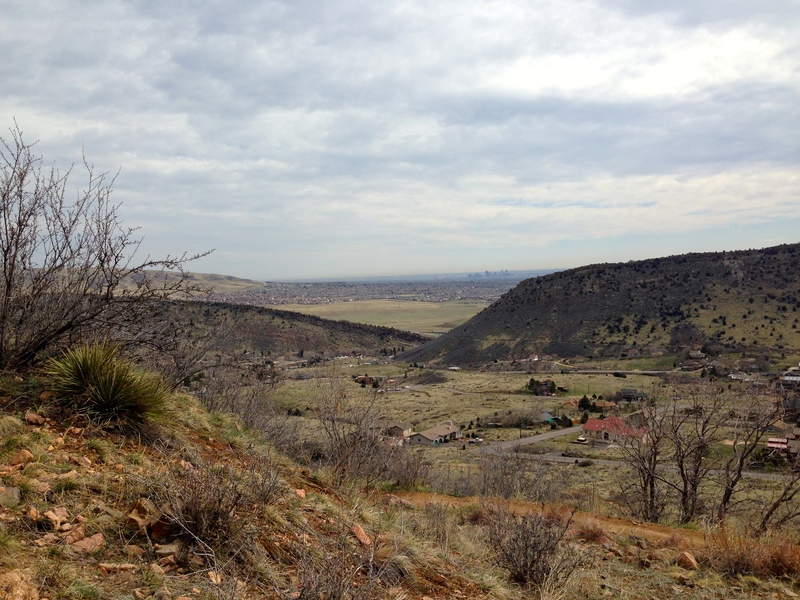 Eventually, I simply left my car in the garage and pedaled to Lookout Mountain from my driveway. Upon reflection, my approach to training for that first race was similar to the way that I had approached other challenges in my life. Break the problem or challenge into smaller, more manageable pieces. At the same time, try approaching the problem from different angles, similar to how I moved my car from place to place to build up endurance. Sometimes a fresh approach to a problem is all the perspective you need to see the solution. On race day in March of 2012, I certainly didn’t come in first. I’m proud to say that I didn’t come in last either! At some point that year, I was able to refer to myself as a cyclist without the air quotes; but I still smile and laugh about it because riding the bike has brought me a profound amount of peace and joy.